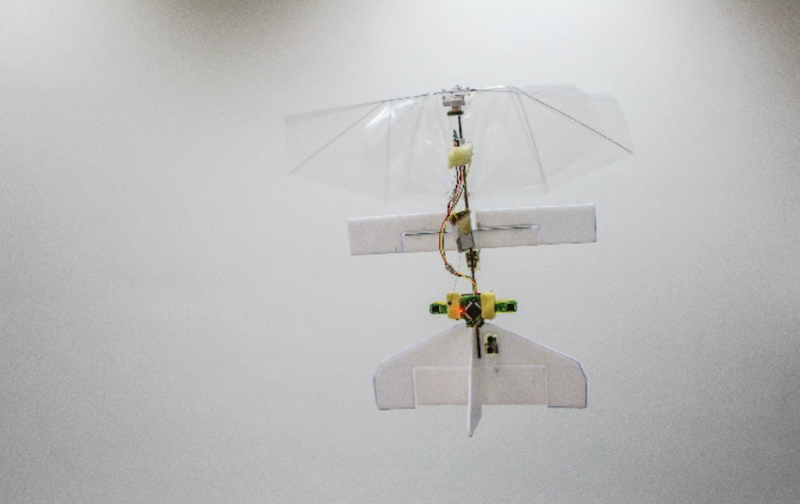 Bio-inspired flapping wing robots hold a great potential. The promise is that they can fly very efficiently even at smaller scales, while being able to fly fast, hover, and make quick maneuvers. 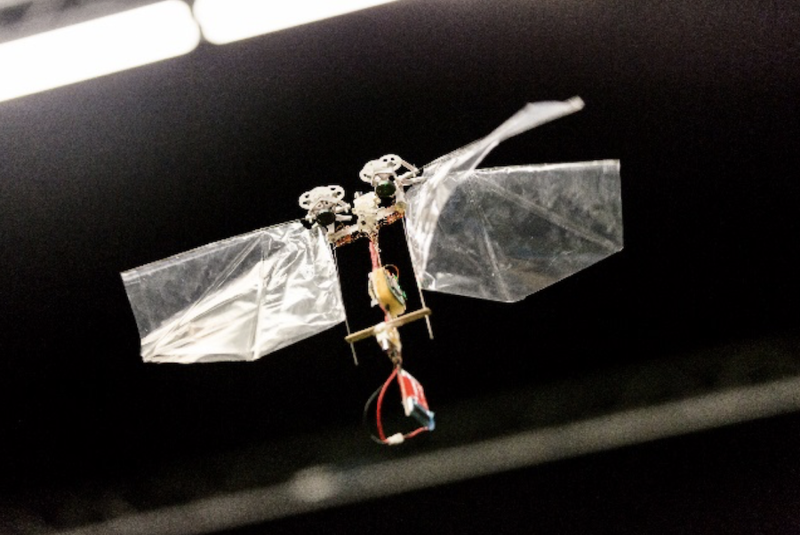 We now present a new flapping wing robot, the DelFly Nimble, that is so agile that it can even accurately mimic the high-speed escape maneuvers of fruit flies. In the scientific article, published in Science, we show that the robot’s motion resembles so much that of the fruit fly that it allowed us to better understand the dynamics of fruit flies during escape maneuvers. Here at Robohub, we wish to give a bit more background about the motivation and process of how we got to the final design of this robot, and what we think the future may bring. At TU Delft, we have been working since 2005 on flapping wing robots. The first one, the DelFly I, was made by a group of students, guided by the lab staff. Already this first model, which had a wingspan of 50 cm and a weight of 21 grams, was designed to carry a camera for remote inspection. In fact, one of the defining aspects of the DelFly, the X-wing configuration, was chosen so that a camera attached to the body would not vibrate too much during flight. This configuration also really worked out well for the efficiency of flight, as the touching and parting of the wings (termed “clap-and-fling”) significantly increased lift production. DelFly I could be tele-piloted with First Person View to fly into a room, look around, and fly out again. Since the first DelFly design, we have been scaling the DelFly down (even down to the camera-equipped, 10cm wingspan and 3 gram DelFly Micro), but we have always kept a focus on keeping a fully operational platform with a camera (see video below). Moreover, we have made the DelFly smarter (e.g., the fully autonomous 20-gram DelFly Explorer in the video below), so that it can fly around in buildings if there is no video link to a human pilot. However, when flying all these DelFly models in realistic real-world environments, we were often faced with the challenges of wind and wind gusts. This definitely is a challenge when flying outdoors, or from outdoors to indoors, but even a strong air conditioning could push the DelFly off its course, enough to cause trouble. The problem here is the fact that all these DelFly models steered by means of an airplane-like tail, with a rudder and elevator. When flying fast, the air would go very fast over these surfaces, providing quite some control authority, but when flying slower, most of the air would come from the flapping of the DelFly’s own wings, leading to less control authority. The solution to this problem is to steer more like insects do: by changing the wing motion to introduce body rotations. This allows for much higher torques, and hence much more agile behavior. Removing the stabilizing tail does introduce the need for active attitude control. 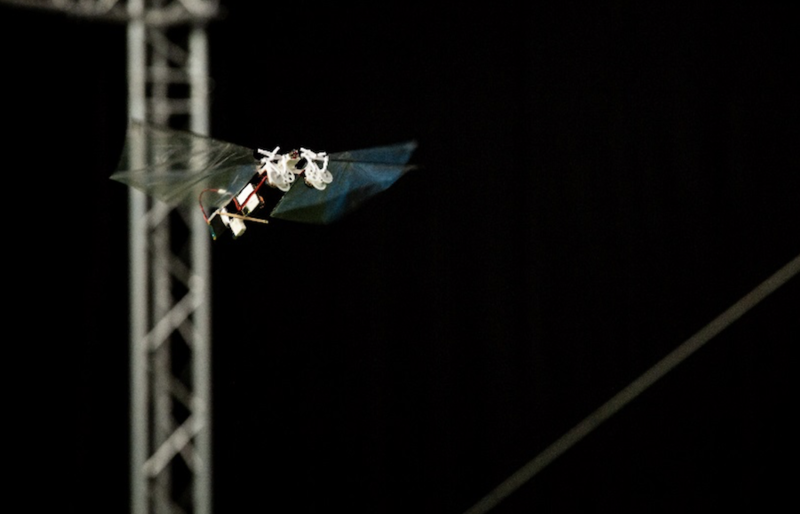 Steering with the wings was first used on a flapping wing robot by AeroVironment’s Nano Hummingbird, and – with a very different mechanical design – is also used on the tiny Robobee. For the DelFly design, we have made some different choices as we will explain below. Looking at flying animals, there are many ways how the rotations around their three orthogonal body axes can be controlled. The wing motion patterns of flying insects show large differences among various species, and the changes in these patterns inducing the body rotations often involve many parameters. However, with robots, we are limited by the currently available actuators, and the current level of technology in general. We were thus searching for a solution that would: 1) require minimal number of actuators to generate the three torques inducing the respective body rotations, and the lift force keeping the robot airborne, 2) be able to generate these torques independently, ideally by mechanically decoupled mechanisms, 3) and that would be as simple as possible, to keep the system lightweight. Moreover, we wanted to reuse as much as possible of our previous, reliable and efficient, DelFly designs. We landed on a concept, which reuses two of the flapping wing mechanisms, each with two 14-cm wings installed only on one side. The two mechanisms, one of each side of the robot, can provide the thrust force but also roll moments, if one of the two wing pairs is driven at a higher frequency, and thus producing higher thrust force, than the other. These two mechanisms are not rigidly fixed to the body, but their relative orientation can be controlled by a simple, 3D-printed servo-actuator-driven gear mechanism. This allows to shift the flapping wings (and their thrust forces) more in front of, or behind the body, which results in a pitch moment, making the body tilt forward or backward. Finally, we have added a third servo actuator that deflects the bottoms of the wing roots asymmetrically; this tilts the thrust vectors clockwise or counter clockwise (when viewed from the top), and results in a yaw torque, making the body turn around its axis. Compared to previous tailless designs, this solution allows production with available and established manufacturing technologies, and relatively easy assembly. Moreover, the effectiveness of the control mechanisms is very high, allowing highly agile maneuvers. Importantly, this effectiveness is rather insensitive to the position of the center of gravity, which can shift when a battery is changed or when a camera is added to the system. Thanks to this insensitivity we can even play with the position of the center of gravity, either making the DelFly more agile or more stable in flight, without losing control authority. Finally, for high-speed forward flight, the DelFly has to move its wings backwards to pitch forward; this also introduces a positive dihedral effect that helps with the stabilization in this fast flight mode. We think that the DelFly Nimble is a great starting point to start exploring real-world applications, such as flying in greenhouses to monitor the crop or flying in warehouses to scan the stock. It can hover for over 5 minutes and when flying fast forward it has a range of a kilometer. With its onboard computer – an open source 2.8 gram Lisa S autopilot that is used for actively stabilizing the robot – we can make it execute pre-programmed behaviors such as flips or rapid turns. Towards the future, we want to investigate ways to make it smaller and smarter, but we promise not to teach it how to lay eggs on the fruit in your kitchen. (1)	Micro Air Vehicle Laboratory, Control and Simulation, Delft University of Technology, Delft, Netherlands. (2)	Experimental Zoology Group, Wageningen University and Research, Wageningen, Netherlands.